While the incidence of acute myeloid leukemia (AML) is still relatively rare, accounting for approximately 1% of cancer deaths in the U.S., rates of occurrence are expected to rise as the largest portion of the population continues to age. Moreover, there remains a significant level of disparity in clinical outcomes, as 50% of patients relapse and die from refractory disease after an initial response to chemotherapy. Now, researchers from the Washington University School of Medicine (WUSM) have published data that suggests lingering cancer-related mutations—detected after initial treatments—are associated with an increased risk of relapse and poor survival. The investigators used next-generation sequencing techniques to profile bone marrow samples from patients with AML. They found that cells carrying mutations 30 days after the initial chemotherapy treatment were roughly three times more likely to relapse and die than patients who cleared the mutations. The WUSM scientists utilized whole genome and exome sequencing on bone marrow samples obtained from 50 patients at the time of their diagnosis and 30 days after the initiation of chemotherapy. The researchers found that 24 of the patients had persistent mutations within their bone marrow cells—suggesting that at least some of the leukemia cells had survived the initial therapy. Additionally, in several cases these same cells were shown to expand and contribute to relapse. 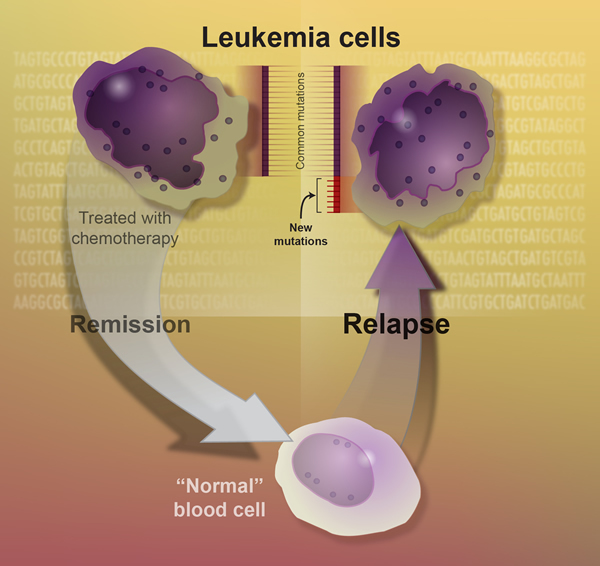 Those with persistent mutations had a median survival of only 10.5 months, compared with 42 months for the 26 patients whose leukemia mutations had been cleared by initial chemotherapy. The researchers are now looking into developing assays to detect residual disease after AML treatment, as well as formulating new therapeutic regimens to target the residual disease. Companion Diagnostics for Cancer: Will NGS Play a Role?